Yanks and Johnny Rebs will be at it again during the St Lawrence County Historical Association’s annual Civil War Reenactment Weekend at Robert Moses State Park, Massena. 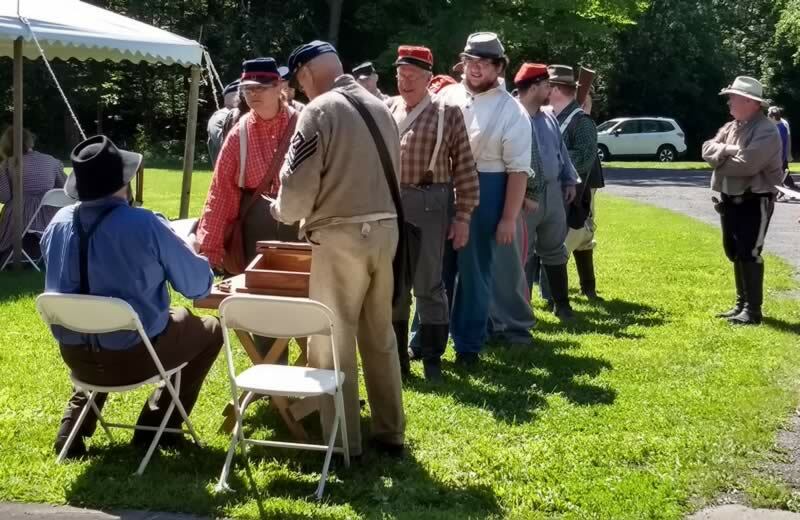 The sights and sounds of the Civil War will fill the air at the 17th annual Civil War Reenactment Saturday and Sunday July 28-29. The event is sponsored by SeaComm Federal Credit Union, with additional support from Stewart’s Shops, Niles Asset Management, St Lawrence Federal Credit Union, A#1 King’s Buffet of Massena, Jock Pest Control, and the Blue Spruce Motel. The military camps are open to the public from 10 am to 5 pm on Saturday, and 10 am to 2 pm on Sunday. Mock battles will be at 3 pm Saturday and 1 pm Sunday. Closing ceremonies will follow the Sunday battle. The Marine Corps League, St Lawrence County Detachment #408 provides a food concession both days. The SLCHA Gift Shop is a great way to take some Civil War history home with books like Young Heroes of the Civil War and Gallantry in the Field: Potsdam and the Civil War. SLCHA members receive a 10% discount on most items in the Gift Shop. The St Lawrence County Historical Association at the Silas Wright House is open Tuesday through Thursday noon to 4 pm, Friday noon to 6 pm and Saturday 10 am to 4 pm. Admission to the museum is free; admission to the archives is free for members and children, $2.50 for college students, and $5 for the general public.The St Lawrence County Historical Association is located at 3 East Main Street, Canton. Parking is available in the back of the SLCHA, next to the museum's main entrance. The St Lawrence County Historical Association is a membership organization open to anyone interested in St Lawrence County history. For more information, or to become a member, call the SLCHA at 315-386-8133 or e-mail. Exhibits and programs are made possible in part with public funds from the New York State Council on the Arts with the support of Governor Andrew Cuomo and the New York State Legislature.